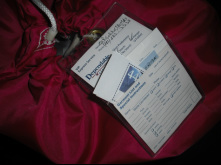 We Specialize in Vinyl Holders for Dry Cleaners! Pictured here is our most popular vinyl holder Item #632-2. Two pockets; one for your business or customer ID card and the other for coupons or messages. Attaches to your Express Bags with simple cable ties. Order online now, or phone/fax/email your order in multiples of 500 @ $0.26 each. We can make any size or configuration vinyl holder. If you have a special holder in mind, please don't hesitate to get in touch, and we will be happy to help you. Please contact us for more information, including free samples!